This is the Best Mexican Beef Tamales Recipe ever. Step by step photos and special tips for making Mom’s light and flavorful masa will help you make her delicious tamales recipe at home. Every family that makes tamales thinks their mom’s tamales recipe is the best. But, my mom’s tamales really are the best. You can ask anyone. I am proud to share her Traditional Mexican Tamales Recipe with you. One of the best things about Mom’s tamales is the masa. It is light and fluffy and full of corn flavor. The filling is a mixture of beef and pork that is cooked until tender then, stirred into a delicious red chile sauce. Mom puts a black olive in the center of the red chile meat before rolling the tamale up in it’s corn husk for steaming. The olive is a signature of a tamales recipe from the Old Southwest. It is not hard to make tamales at home but, they do take some time. So, making tamales is the perfect time to gather family and friends around the table for a day of fun and friendship. In the Southwest, tamale making at Christmas time is a treasured tradition. Families gather together and spend the day rolling tamales together. My mother, my sister and I have made dozens and dozens of tamales together over the years and look forward to making a big batch anytime we can. To us, making this tamales recipe is an art form. 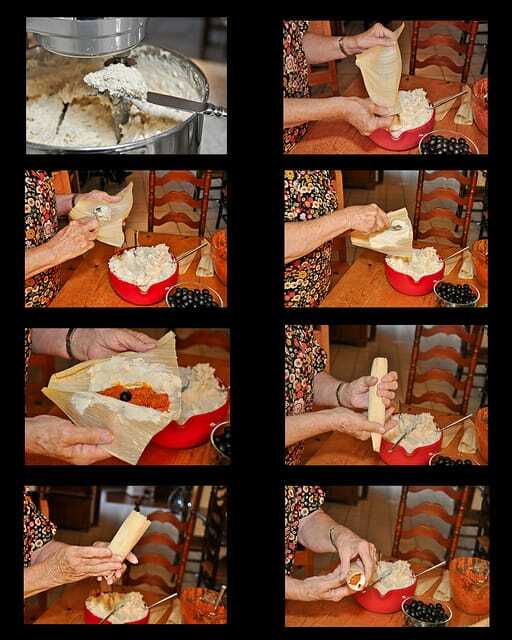 We have shared step by step pictures of Mom’s (AKA Carol Hicks) technique for mixing the masa and rolling the tamales so that you will get a tamale that is just as light and beautiful as Mom’s. Cook the beef and pork mixture the day before preparing the masa and rolling the tamales. Refrigerate the meat mixture overnight in a large bowl so that the fat will rise to the top and solidify. Remove the fat from the top of the meat before mixing into the red chile sauce. Buy fresh, plain masa NOT masa that is already prepared with lard. Here is the link to my Mexican Food Basics: Masa Basics post to show you the different types of masa. Note: this recipe is not formulated for dried, packaged masa mix or masa harina. You must use fresh masa. 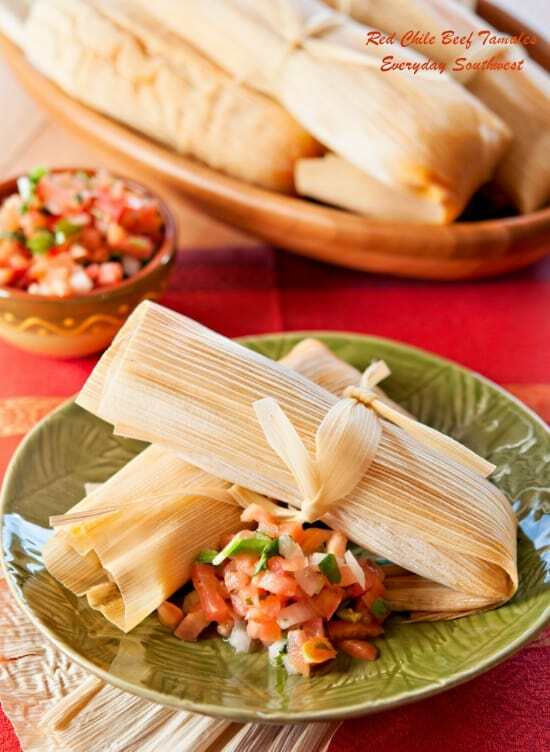 See our Tamales Recipes page for tamales with dried masa harina or masa mix. The masa should not be compressed and dense or squished into a hard lump during transport or storage. Try to loosen it up a little before adding it to the lard mixture by breaking it into smaller chuncks. Buy a little extra lard. The key to fluffy tamales is whipping in enough lard and air into the masa so that a small spoonful of masa will float on the top of a glass of cold water. If the masa doesn’t float, whip it some more and add more lard a little bit at a time. Soak the corn husks in water over night. We soak quite a few at a time so I use a medium sized ice chest with enough water to submerge the husks in the water and rinse them off at the same time. Spread the masa gently so that you don’t over work the masa. Treat the masa like you would treat buttercream icing. Leave a border around the edge of the corn husk with no masa on it so that the bare edges can be brought together while rollling the tamale keeping the masa inside. Fold the bottom of the corn husk up, sealing off the bottom of the tamale. Place the tamales upright in a large steamer. Make sure the tamales are upright in the steamer and packed well enough to keep their shape and not fall over in the steamer. Do not let boiling water reach the bottoms of the tamales. The boiling water will make that part of the tamale very tough. Check the steamer often to ensure there is still water in the pan and it has not boiled out. Add more water when needed but, try not to get water in the tamales. The masa should be light and fluffy like buttercream frosting when you are finished. You can tell the masa is ready when a teaspoon full of masa floats to the top of glass of cold water. Remember to soak the corn husks submerged in water overnight before you start so that they will be soft and supple when you roll the tamales. Give the corn husk a little “stretch” before you spread in the masa. Be careful not to tear the corn husk. You can over lap smaller husks together before spreading on the masa which will “glue them together. Spread the masa on the corn husk about a 1/4 inch thick. Leave a one inch margin around the top and the side edges with about 2 inches of margin on the bottom edge. The meat for the filling should also be made the day ahead so that it can be refrigerated over night. Chilling the meat over night will allow more of the fat to rise to the top and be easily removed from the mixture. Too much fat in the meat will discolor the masa and change the texture of the tamale. Spoon the meat filling down the center of the tamale placing an olive in the very center. Carefully fold the corn husk around the tamale making sure the masa completely incloses the meat on the bottom and sides of the tamales. The perfect homemade tamales leave the tops open and the filling slightly showing from the top. Gently ease the tamale into a beautiful, round cylinder. You may tie the tamale around the center with a strip of corn husk for decorative purposes and to securely close the corn husk but, as you get used to rolling the tamales, they will hold their own shape without the tie. Fold the bottom of the corn husk up so that the tamale is enclosed and protected from the steam while cooking. Try not to stack too may tamales on top of each other until they have been frozen or steamed. The weight of additional tamales will not only misshape them but, also create the dense masa you are trying to avoid. 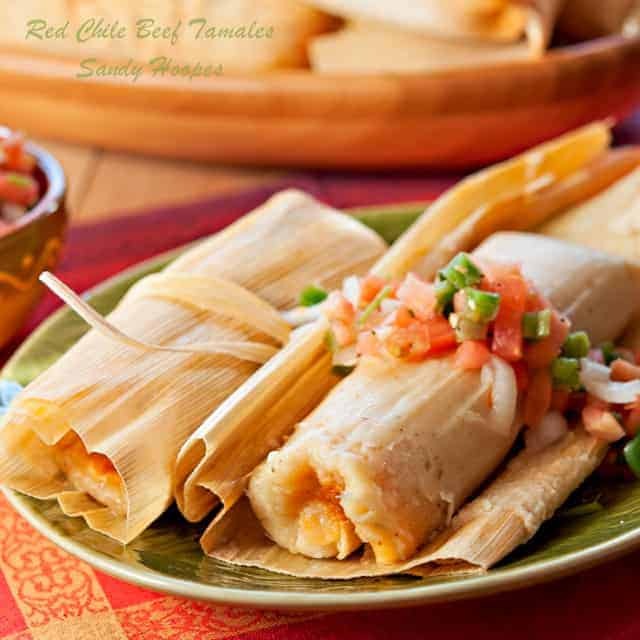 Shop this affiliate link to help you find everything you will need to make this tamales recipe. These are the tamales we grew up on. Mom has made several adaptions from the original recipe including the mixture of both pork and beef. The tamales are light and fluffy with only a tiny bit of heat. The olive in the center of the tamale is a must for us and is traditional to Arizona-Sonoran Cuisine. Cook meat, garlic and salt in a slow cooker for 6 to 8 hours on high. Place in refrigerator and chill. Remove meat from refrigerator and remove solidified fat from top. Drain off liquid, reserving one cup to use in masa. Shred meat with a fork. Lightly brown the flour in the oil in a stockpot over medium high heat. Add in remaining ingredients and cook until thickened. Cool to room temperature before using. Stir suce into meat. 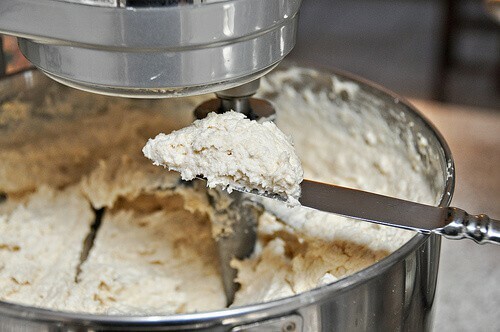 Beat lard with a stand mixer to the consistency of whipped cream (takes about 15 minutes on highest setting). Add masa a little at a time in small, golfball sized pieces. Slowly add the beef broth into whipped lard and masa mixture. Continue whipping the mixture until a small spoonful of masa floats in cold water. Spread ¼ to ⅓ cup masa on corn husks, a little thicker than ¼ inch thick. Spread a rectangle that covers husks except 2 inches at bottom and 1 inch at top. Place about 2 tablespoons of filling in center and add one ripe black olive. Roll together so that masa completely encircles filling. Fold bottom end up and place upright in a steamer, folded side down. Steam for about 40 minutes when fresh, or 90 minutes when frozen. We know you will love these tamales as much as we do. They are the perfect tamale so… why waste time with any other? Let us know how you like them, we love hearing from you. Be sure to check out our Facebook fan page this week, I will be posting the ingredient lists for the rest of this week’s Mayan inspired recipe so that you can shop ahead of time and be ready on the big day! I can’t think of a better tradition to inherit! Can’t wait to make some more with you so, so soon! Best Christmas food. Ever. Let’s make 100 dozen!!! You are most welcome – and we are not joking. These really ARE the best tamales ever! Happy Holidays to you! I think you made a big mistake with your ingredient list. You said five POUNDS of masa harina…I’m pretty sure you meant five CUPS. We used your recipe yesterday and had a heck of time trying to fix the masa mixture once we realized your mistake. Jennifer – so sorry you had trouble! I have never used dry “masa harina” to make tamales – so sorry if that’s how it came across. You need to buy fresh ground masa – I buy mine at a local Latino market. BUt, if you only have access to the dried stuff at the grocery store, you need to reconstitute if according to the package directions. I like tamales so much was lucky enough to have a real mexican rest. in my hometown with real mexican cook. The tamales must have been delicious! Thanks for stopping by! 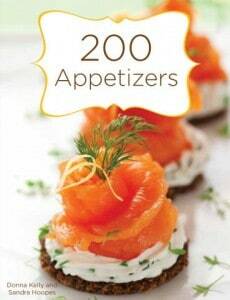 These look so yummy, it is so fun to learn to cook from our mother’s. I hope to leave my girls with the favorites! Those tamales look like a real labor of love and so delicious. What a wonderful, wonderful food tradition! I love it! I always buy homemade tamales around the holidays, as I’m always a little intimidated to make them! I’m pinning your recipe to keep it on hand. I might try them after the hustle and bustle of the holidays when I can focus 🙂 Thank you for sharing! How many dozens does this make? Hi Ondrea, I had to check with my mom to be sure of the amount, she says it makes about 5 dozen but that will depend on how big you m are the tamales. Hope that helps. Have fun making the tamales! We always have such a good time when everyone gathers around to help! I used to make tamales YEARS ago with my suegra when I was married to her son. We never put a black olive in the tamales but that does sound good. I love olives, but will be trying your recipe for some people who don’t. What if I dice black olives up fine, and “hide” it in the tamale…that should work, right? I used to have a traditional pot for steaming them, but moved and had to leave some things behind…any pot deep enough should work though, as long as I have a lid. Does the lid have to fit tightly? Can’t wait to try this. 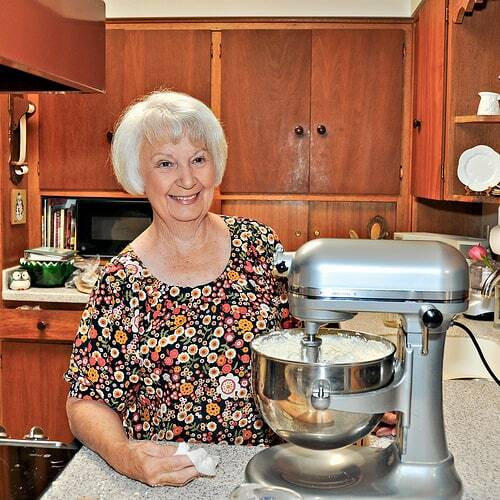 Thank you so much for sharing your family recipe. Merry Christmas and Happy new year. P.S. Anybody who makes tamales needs to know that the masa HAS to be spread on the smooth side of the corn husk or they will not come out easily, the tamale should loosen easily from the husk. Hi Sharon, The olive is an “Old School Arizona” thing. You certainly do not need to add it to the tamales. Please feel free to leave it out. I would not chop the olives, it is easy for anyone who does not like the olive to pick it out if the olive is whole. And yes, any large pot will do as long as the tamales are not actually in the boiling water. The lid does not have to fit perfectly, just be sure to keep checking the water level because more steam will escape with a loose lid. Thanks for reminding me to add the tip about the smooth side of the corn husks! Your recipe looks just like I remember my grandma use ro make them for our huge family gatherings. How many dozens come out of that recipe about? This is such a detailed recipe! Thank you for walking me through it step by step! This fabulous Mexican beef tamale recipe came out picture perfect – just as you described in your recipe. The aroma, texture and flavors were fabulous! I spend about 3 months a year in Puerto Vallarta, Mexico, so I know an authentic recipe when I see one. I’m so happy I found yours! It’s taken me so long to find a Tamales recipe that tastes like the ones I tried in Central America this was fantastic. I consider myself a tamale expert, and these are the real deal! I live in San Antonio where a lot of people make these and sell them at Christmas. I have never attempted it, although I do have a tamale steamer pot! These turned out so delicious! I cannot wait to make them again. Oh my goodness I absolutely LOVE mexican food. I could eat it every single day. Thank you for this recipe! This is so delicious and easy to follow! Do you have a good mild recipe god the red Chile? Also I live in Phoenix do you know where I should go to get the fresh ground masa? Hi Erika. It is good to hear from you! I do have a red chile recipe but it is not on the blog, yet. I will let you know when I do post it. As for the red chile sauce in this tamale recipe, our family has used Las Palmas brand of canned red chile sauce for as long as my mom can remember (it saves a little time and clean up). It is a good, traditional recipe and is very mild. We like the mild sauce in our tamales because everyone is happy with it and the “heat lovers” can add some salsa. As for the fresh masa in Phoenix, I usually drive to the downtown area and go to the Ranch Market on 16th street and Roosevelt. BUT I have used Food City’s fresh masa before and it is very nice, too. Try to make sure that the masa is as fresh as possible. I was a little surprised to read that you use canned red chile sauce and canned tomato sauce. But it sure sounds easier than using the dry chile pods and the work involved in making the chile sauce the way my mom used to do. She was from New Mexico, and always used the New Mexico dry chile pods to make the sauce. I’ll have to try your recipe. They sound really good. Do you use a particular brand of red chile sauce? Thank you. Hi Catalina, It’s so good to hear from a fellow tamale lover! Your mother’s tamales sound delicious! This is my mom’s recipe and she does use the canned chile sauce. It made things a little easier with 6 kids running around under foot. 🙂 I use homemade chile sauce in my tamales that has a blend of chiles, it is also a little hotter than the canned sauce which is very mild (Mom uses Las Palmas Red Chile Sauce). The key to my mom’s tamales is the incredibly fluffy fresh masa. I will have to added my chile sauce recipe to the blog. Thanks for reminding me! I hope to hear from you again soon! We have hunters in our family and we have rabbit and venison always and I am going to try this and I think it might turn out really good will let you know. Thanks for the guidance and the wonderful recipe and the step by step directions. Hi Cookie! Please do let me know how these tamales are with other meats. I’m sure they will be delicious with venison and rabbit.